Former KGB colonel and Russian President Vladimir Putin (aka Vlad the Invader) initiated a phone call with the Commander-in-Chief yesterday to discuss diplomatic solutions to the Ukrainian crisis. Crimea was apparently not mentioned, giving the impression that that train has left the station on that front. Nothing to discuss there. Given the fact that the day before the UN General Assembly failed to issue a resolution to condemn the annexation of the peninsula, the colonel’s timing was impeccable. In my previous pieces here on Breitbart, I have aimed to open a discussion on why the fate of the Ukraine is not irrelevant to the national interests of America and the average American. The way the crisis is evolving (or degenerating, rather) allows us to make a broader “macrostrategic” observation. The unburnished truth is that the events of the last month have together hammered the final nails into the coffin of the international relations theories and Democrat narratives of the last twenty years. In the 1990s, we were told that bipolarity was over, we now lived in an age of multipolarity, that differences would be resolved diplomatically, and that all we needed to concentrate on internationally was that there would be more democracies in the world (since democracies don’t go the war with each other). The fancy phrase for this idea — which was bought into by both Democrats and Republicans in fact — was Democratic Peace Theory. Then came the neocons, 9/11, Afghanistan, and Iraq. Since 2008, we have been told that there are “good” wars and “bad” wars, and that America just isn’t special. (“We believe in American Exceptionalism in the same way Greeks believe in Greek Exceptionalism.”) The emphasis was placed once more upon “talking” our way out of problems, even if it’s with fundamentalist regimes like Iran that spout anti-American rhetoric that calls for our destruction and which want to acquire nuclear weapons. Now Russia’s success in enlarging its territory by military means, the West’s inability to stop him, and the utter failure of the much-vaunted (at least by the Left) United Nations brings us to a crossroads. Blue pill or red pill? The blue pill will let you continue to believe that thugs like Putin, the mullahs, etc., really give a hoot about what the “international community” wants and that you can talk your way out of any confrontation with a bully. Swallowing the red pill will make you realize that the original founders of conservative and realist thought, greats such as Hobbes and Machiavelli, understood one truth to be eternal: the nature of Man is immutable, conflict is inevitable, so if you want peace, prepare for war (Before any reader explodes at my mention of Machiavelli as a result of believing the bad rap he has as a conniving manipulator, please read his book The Prince first, then make you judgement as to whether he was a principled man or not). The international system is bust. In fact, it never really worked. How could it with Russia and China on the UN Security Council? But it’s not just the idealism of left-wing approaches to global politics that has been blown out of the water by recent events in Europe. We need to reassess the pro-isolationist/non-interventionist views on the right as well. The best way to do this is to look at American history in the last 100 years and the great wars we have been involved in. Whether is was World War I, World War II, Vietnam, or even the Balkans in the 90s, we were always caught off guard when a Democrat was in the White House. Idealism, whether it was the one-world naiveté of Woodrow Wilson or the pollster-driven myopia of Bill Clinton, is also seen as an empty vacuum to be exploited by the enemies of freedom and liberty. Having an isolationist in the Oval Office wouldn’t have made us any safer either. Saying you don’t care about Hitler, Tojo, or bin Laden doesn’t magically make them not care about attacking America. 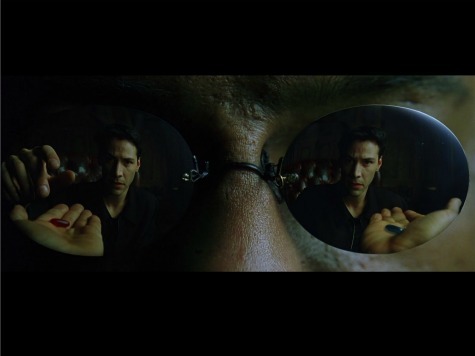 Popping the red pill allows you to see that the world is, and always has been, a very dangerous place, that we are a part of that world, and, whether we like it or not, there will always be threats outside the US that have a direct or indirect effect on our national security. Putin took the red pill long ago. Time for the Washington elite to do likewise. Sebastian Gorka is an irregular warfare and counterterrorism instructor for the US Army Special Operations Command (Green Berets), US Special Operations Command, and the FBI. The views expressed are his own. Dr. Gorka can be reached directly at: TheBriefing@Breitbart.com.